Doug Pemberton of the Artificial Reef Society of BC had secured some funding to bring divers out to the HMCS Annapolis to further the Vancouver Aquarium's Annapolis Biodiversity Index Study (ABIS). Heather and I were lucky enough to be picked to go along for one of the dives. The previous weekend had been scrapped due to very bad weather. A huge storm blasted through, cancelled ferries, and generally wreaked havoc. To be honest it wasn't as bad as it could have been, but it definitely was not a good weekend to be out on a boat! The next weekend was good though. 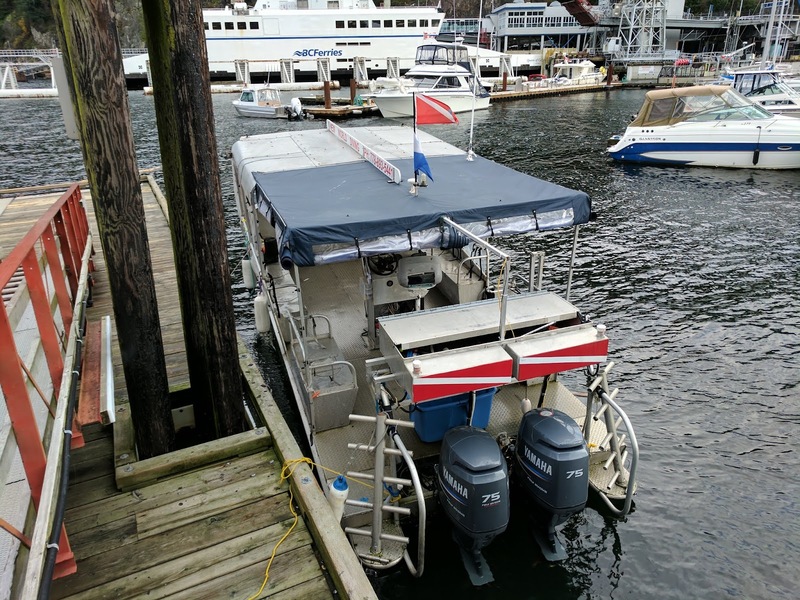 We met at Horeshoe Bay, ready to go out with Jacques and New World Diving. On board was myself, Heather, Doug, Dirk and an old dive buddy Cedric. I had first met Cedric way back in 2010 for a great dive in Dodd Narrows. It had been a long time! Here was our ride. Doug brought donuts, and we were off to the Annapolis. 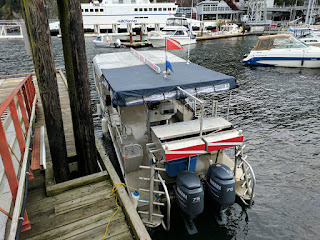 We had not been out with New World Diving, and the boat was set up nicely. The twin ladders off the back were a nice addition. Doug was keen to help the Aquarium track species growth on the Annapolis, so that was why he was organizing teams of divers to periodically visit different areas of the ship. The key to data collection for ABIS was to take lots of video and pictures, but also to make careful notes on where on the ship you were. Also, documenting what was not there was just as key, since in the future, if something new shows up, you can tell when. This was a difficult concept to grasp, as most of the time when we are diving we look for the best picture and video possible. The first dive plan was for Heather and I to video and photograph the bow area of the ship. Unfortunately the photo part didn't work out due to a flooded camera, but we did get good video. From my perspective life had seemed to plateau a bit, with a lot of sea stars, shrimp, and mussels, but not a lot else (at least to my eyes). According to the ABIS study, over 70 species had been observed so far, so there definitely was something happening! On the second dive, we did the bridge and antenna circle. Even more shrimp looked out from all the nooks and crannies. Our dive team wasn't the only one with technical problems. Dirk and Cedric had a camera failure as well. Such things happen, in diving unfortunately. Another thing that Doug had us look for was graffiti on the ship. The brown algae mat that covered the ship formed the basis of the food chain, but people had also been using their fingers to write in it. Not only were they creating annoying (and sometimes offensive) pictures and writing, it was destroying the foundation of life on ship. I guess you just can't get away from childish and fool-hardy people, even underwater. I hoped that Doug's message to the diving community would hopefully put a stop to this behavior. Heather and I also took the opportunity to collect some data for GUE Project Baseline Halkett Bay. We stopped at Station B on top of the bridge and took temperature and visibility readings. From my recent work on this project, I even got a write-up in one of the GUE Project Baseline newsletters. Yes, that was me tooting my own horn! If you would like to see the resulting (long!) video, here it is. Remember, it was not meant to be pretty, it was meant as documentation of a point in time, with detailed notes on ship locations.